The air was cool but not frosty. A light dew draped itself over the grass. Crystal-blue dawn glowed in the east. Not a whiff of breeze stirred. May perfection. Sitting in a point of timber that poked far into a field, my back rested against an ancient, honorable and mighty white oak, its lime-green leaves half unfurled in their annual cycle of emergence. The hickories, basswoods, ash trees and surrounding shrubs were fully leafed out. An hour later, it didn't matter that no turkeys had yet responded to my calling overtures. Gobbles had sounded from all directions early on, and I knew the birds were around. Soaking in the sun and making occasional turkey music on my box or mouth call, life was good. Patience, I told myself. It's May. Then life got even better. A black blob appeared in a field across the shallow valley. A peek through binoculars confirmed it: A gobbler. He was over a half-mile away, but my heartbeat quickened. It's May. Anything can happen. The turkey flashed into brief strut, then belted out a gobble I could barely hear. He was that far away. But he was alone and on the prowl. Though a brushy ditch, a swollen creek, several fences and a pasture full of steers separated us, he was worth a try. Fortune favors the bold, they say. I picked up my box call and stroked out a string of loud and raspy yelps. Would the turkey hear me? Another faint gobble sang to my ears, but the tom disappeared. What happened next amazed me. The bird soon stood on my side of the ditch. He’d ducked a fence, navigated a wide swath of thick rabbit-hunting cover, hopped a rain-swollen creek, and slid under another fence to get into the pasture. Looking around, he flashed into strut. A few more strokes from my box call drew a gobble, then the bird slicked down and started winding his way through a small herd of black Angus steers. I called maybe once more as my heart's pounding increased with each of the bird's jogging steps. One cow chased him off course briefly. He slithered under another fence, ran across the final plowed field that separated us, then slammed into full strut 30 yards out when he topped a rise and saw my decoy. I let him dance a little closer before carefully lining up my shotgun barrel's beads and squeezing the trigger. Sitting next to the beautiful bird, I had to marvel. That Eastern turkey traveled over a half mile of Wisconsin countryside to get to me. He crossed barriers that turkeys aren't supposed to cross. He couldn't wait to get to that “hen” up in the woods. Four good hunters had worked this farm, one each over the previous four weeks, without bagging a single bird. What was the difference? It was mid-May. Yes, the hunting season was in its fifth week. But the turkeys hadn't gone anywhere. Gobblers still wanted to breed. Hens had loved them and left them. Nobody else was hunting. They're missing out on the merry month of May, I thought. The farther north you travel, the more important May is to spring turkey hunters. In some states, the season stays open for the entire month. While many southern states' seasons are closed or closing by early May, some states (such as New York), don't even start hunting until May 1. I always find it interesting that many Yankee hunters travel south for early season warm-up hunts, but fewer southern boys come north late in the season. Rebels, here's your invitation! For my money, here are a half dozen of the best turkey states for May hunting. Wisconsin. Wisconsin is fast becoming the nation's most prolific turkey producing state, with annual spring harvests hovering around 50,000 birds. The state divides the overall hunt into six one-week hunt periods. The fifth and sixth periods fall in mid-May and beyond. There are always leftover tags available, and the birds are hot. www.dnr.wi.gov. South Dakota. If you head to the public-land-rich Black Hills in April, you're as likely to be hunting in a snowstorm as a pleasant, sunny morning. Most serious Black Hills hunters don't go until the first, or better yet second or third, week of May. The birds have split their winter flocks by then, and you might escape without putting on your whites. www.gfp.sd.gov. New York. The first couple weeks of New York's May season are fine, but by mid-month the hunting pressure slows considerably and the birds hit another gobbling peak. My very first turkey hunt, so long ago now, happened in the Empire State in May's third week, ending with a Columbia County bird. www.dec.ny.gov. Ontario. International turkey hunting, anyone? If you consider Canada a foreign country, why not! Ontario is fast becoming a turkey hunting paradise, with the birds pioneering more and more of the province's farmland countryside. Even better, the people here are friendly and generous – you can still knock on doors and hunt. You want to hunt turkeys, ay? Sure thing! www.mnr.gov.on.ca. Studies show that spring sees two gobbling peaks – one early when the breeding season is starting, and one later when the hens start sitting on their nests but the gobblers are still ready for action. This second peak occurs in May in the states we're talking about. For instance, my hunting log shows some of the best gobbling days of any spring, anywhere, occurring on the dates of May 13, 14, 17, 19 and 21, in places such as Minnesota, Wisconsin, Massachusetts and South Dakota. As May wears on, don't be afraid to crank it up a little bit in the calling department. This bucks conventional wisdom, but some birds need it. One May 21 Wisconsin bird took me two hours of almost nonstop calling. If I shut up, he'd walk away. When I'd call, he'd stand there and gobble. He finally broke and poked to within 40 yards, so I poked his noggin with a load of Winchester Supreme No. 5s. May offers the advantage of screening cover. 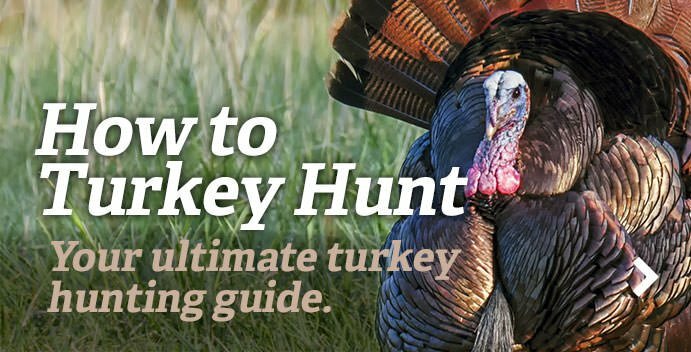 In early season, making a necessary move on a gobbler can expose you and spook him. But in May, with all the leaves out, making a sneak to a new calling spot is much easier. The leaves also help shield you from the turkeys when you set up. Leaves do make it tougher to spot an approaching bird, but the foliage usually isn't a big problem where things matter most – around shooting range. Remember this about leaves too: They can muffle a bird's gobbles and make him seem farther away than he really is. Err on the side of caution when sneaking in for a setup on a gobbling bird. On the other hand, if you've got a bird roosted, leaf cover can help you sidle in especially close in the pre-dawn darkness. As for May decoying tactics, simplicity is best. Gobblers now are more interested in mating than they are fighting with each other. It hurts my brain to think about jake, half-strut and strutter decoys right now. One hen decoy is the answer. Give that gobbler what he wants: a lonely woman. Finally, hunt the afternoons where legal. Conventional wisdom says that mid-morning is prime. But May afternoons, after three o'clock or so, can be even better. The toms have been alone all day, and they like to feed and strut now. They might not gobble much, but they will investigate hen talk. The next afternoon of that Wisconsin hunt, with a second tag in my pocket, I was glassing two gobblers alone in a hay field in another corner of the farm. I slithered through some tall creekbottom grass, hitched along in the brush, and improvised a setup: I stood against a tall ditch bank, gun in front of me, only my head peeking through a screen of weeds. I called to the birds, and they looked up, almost disbelievingly. Another call, and they were on their way. Not a gobble rang out, but they marched and fed my way with a purpose. At one point, my farmer friend Scott drove along the field's far end with his tractor, and the turkeys squatted down in the tall alfalfa! When Scott had passed, the birds stood and continued their approach. They strutted back and forth, pleading for that hen to show herself, but only the boom of my shotgun greeted their desires. I think I shot the smaller bird, but that's okay. Small is a relative term when you're talking farm-county gobblers. The big guy will be back there again this May, and I'll be out there pursuing him in the midst of our merriest month.